Kansas City native James Ward founded The James Ward Band in 1997. As bass player he performed with Marcus Roberts, Wycliffe Gordon, Nat Adderly, Mark Whitfield and many more. Recently he toured with Oleta Adams in South Africa. The JWB presents Latin, R&B, Fusion, Funk, Jazz, and Gospel. Their albums are oriented to contemporary jazz and smooth jazz. In 2007 they released their first album In Perspective, which reached a high rank in the Smooth Jazz Indie Charts. Their sophomore album Groove Axis was released in 2010. Groove Axis features band members James Ward (bass), Angela Ward (keyboards), Ray Stewart (percussion), Matt Hopper (guitar), Gerald Dunn (soprano and tenor sax), and Ryan Lee (drums). The album starts with the heavy and funky title track. James' earth-bounded bass builds a solid ground for Gerald Dunn's sax melody. AG (Angies's Groove) features Angela Ward on keyboards. She has blessed hands and is also the congenial arranger of the group. On Echoes the group invites sax player Aaron Simcox. Aaron plays with Big Bands like the Boulevard band, groups and combos in and around Kansas City. An artistic musician. Got To Get You Into My Life, a song by the Beatles, was perfectly covered by Earth, Wind & Fire. Their version reached number 1 on the Black Singles chart and number nine on the Pop singles chart. It is the shattering brass fanfare at the beginning of the song, which makes this piece so attractive for bands with a horn section. The JWB is supported on this track by Clint Ashlock on trumpet, Jason Guedeou, and Karetta Carter on trombone. Superb! Waves evokes an atmospheric other-worldly mood featuring vibraphonist Greg Carroll and Ashley Wenberg on flute. Change Of Seasons presents jazz fusion, Latin jazz and smooth jazz in a seething mix. Angela Ward is the master of all kind of jazz. Bass player James Ward takes the lead on the instrumental ballade More Of You. Guitarist Matt Hopper adds some Italian flair for the ultimate Holidays temper. 2 Minute Chase is a good opportunity to showcase Gerald Dunn on sax and Ryan Lee on drums, who excel on their instruments. Have some fun with Bet That Up Reprise, a splendid excursion into the time of Saturday Night Fever peppered with a great dose of jazz. The Sahara is the greatest desert on earth with fascinating landscapes and cultures. The JWB conjures with oriental flavored tones the aura of this strange region. 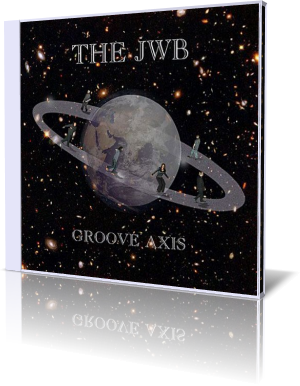 Groove Axis is the edgy pattern book of a vivid contemporary jazz band. Kansas City's worthy contribution to the smooth jazz genre.